UW-Madison is utilizing the COSO Internal Controls Framework as a guideline for establishing its own internal financial controls framework. The COSO Framework provides an established, best-practice set of concepts and components by which to assess control systems. Applying the COSO Framework as a foundational point in this initiative will help UW-Madison more efficiently identify the objectives and requirements needed to define and support excellence in financial stewardship. 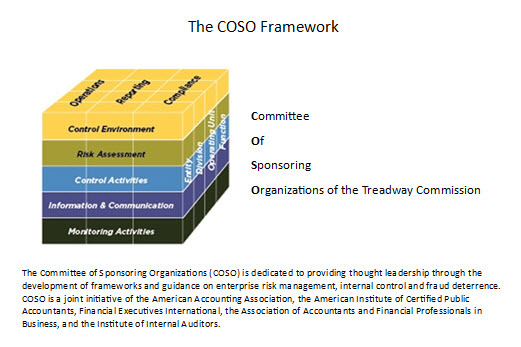 The Committee of Sponsoring Organizations of the Treadway Commission (COSO). Visit the COSO website. Internal control is a process. It is a means to an end, not an end in itself. Internal control is affected by people. It's not merely policy, manuals, and forms, but people at every level of an organization. Internal control can be expected to provide only reasonable assurance, not absolute assurance, to an entity's management and board. Commitment of leadership and senior management to effective internal control, adherence to high ethical standards, oversight by those in governance, and support of competent employees. Dynamic and iterative process for identifying and analyzing risks towards achieving the organization's objectives. Forms the basis for determining how risks should be managed. Identifies the areas where the greatest threat or risk of inaccuracies or loss exist, with the greatest risks receiving the greatest attention and control. Consideration given to dollar amounts, nature of the transactions and impact on organizational reputation. Actions established by policies and procedures to help ensure management directives to mitigate risks to the achievement of objectives are carried out at all levels of the organization, at various stages of operating processes and over the technology environment. Information generated at operational levels and communicated across and up the organization to enhance decision-making. 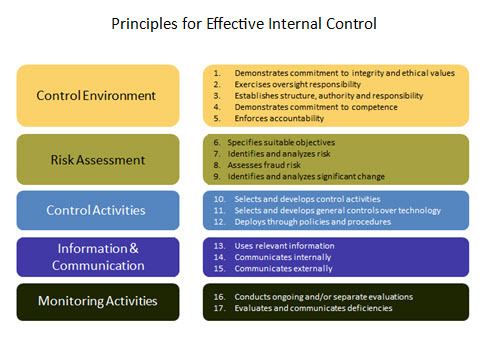 Policies and procedures communicated downward through the organization to support internal control functions. Information and communication to be fully integrated with the other components of the framework and includes communication with outside parties about internal control and accountability. Applies to all five components of internal control. Takes on increased importance as the organization recognizes the need for timely and effective monitoring that provides feedback on the operation of the other components, and extends beyond financial reporting to compliance and operations.